CVQO (Cadet Vocational Qualifications Organisation) is proud to announce the outstanding achievements of Cadet Sergeant Major Precious Oyelade, 18, a member of South East London ACF who was named today (20th June) as the winner of the educational charity’s ILM Achievement Award. At the ceremony and luncheon at the Ironmongers’ Hall in London, Precious was presented with the Award by ILM Business Manager Karen Read (both pictured). 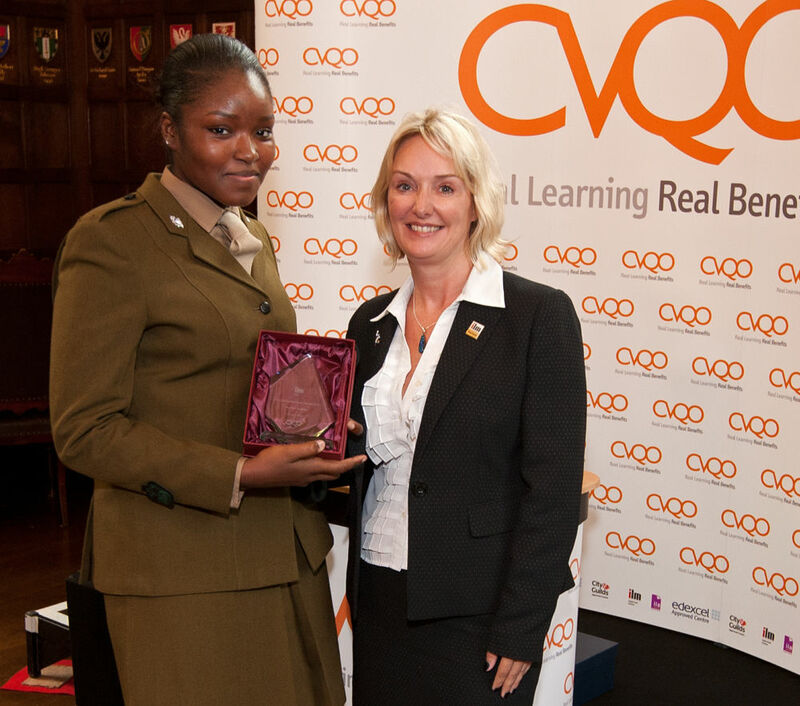 The award was presented as part of the Duke of Westminster Award ceremony, an annual competition organised by CVQO to recognise its most outstanding learners. The nine finalists for the award have been selected from 300 nominations, from over 20,000 eligible CVQO learners nationwide. These are young people who possess a wide range of skills and abilities and have overcome personal challenges, as well as demonstrating a consistently high level of commitment to their communities and their peers. Each has completed BTEC qualifications with CVQO that reflect the skills they have developed as members of UK youth organisations. Other organisations that took part include members of the Sea Cadet Corps (SCC), the Air Training Corps (ATC) and St John Ambulance. Following the presentation, Precious, along with the eight other finalists, were also awarded with their ILM Level 3 qualifications, earned through their activities at the Duke of Westminster’s Award selection event in April. The winners then enjoyed lunch with their friends, families and CVQO patrons including Lorraine Kelly and Kate Adie. On 13th July, they depart for a three week expedition to South Africa where they will undertake an environmental awareness course in Kwa Zulu Natal and a cultural project working with and teaching orphaned children. In addition they will visit Rorkes Drift, Isandlwana and take part in a walking safari.